Blurry desktop apps after screen resolution changes have been a high profile bugbear in Windows for quite some time. With the growth in popularity of convertibles and casting of screens there is a lot more 'docking, undocking, and remoting' going on, which often knocks Windows desktop app graphics out of kilter, resulting in a blurry appearance to the app. Windows Preview Build 16237 has "changed the way that Windows provides DPI-related information to these applications such that each time one of these applications starts, they’ll get updated data from Windows," explains the blog. So for blur affected apps you only have to restart the affected app to enjoy crisp graphics again. That's still not a perfect solution but a good step better than having to go through a log-out/log-in cycle when you change the connected/docked/remote display. Please note that the new build doesn't fix these problems on secondary displays when in 'extend mode'. For user friendliness in an oft-used part of the Windows UI there have been a number of Notification and Action Centre improvements. A key change makes it easier than ever to take action on your notifications. Furthermore, Microsoft has made it clearer that dismissing a notification only pushes it to the action centre for later attention - it won't be deleted. 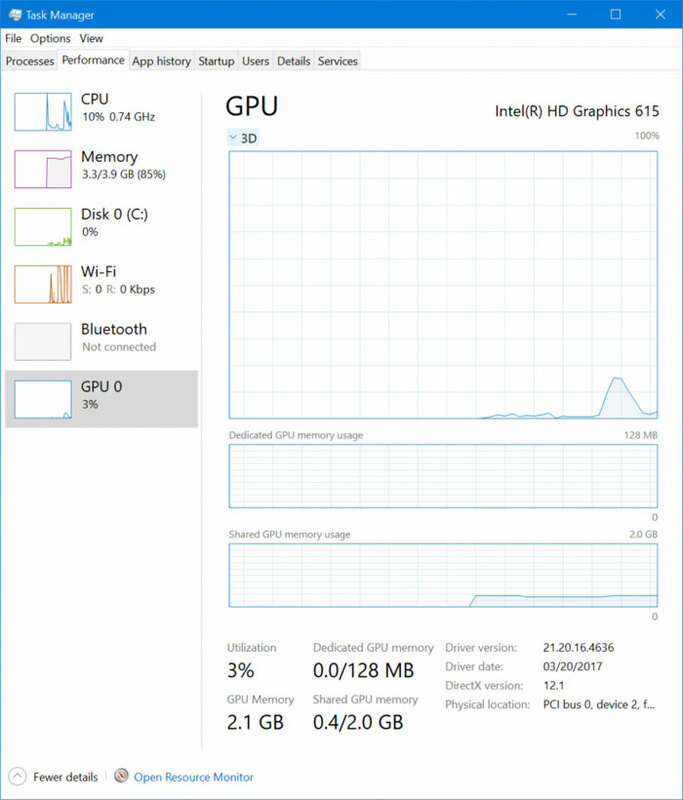 Microsoft added its GPU(s) monitor to Task Manager in Win 10 Build 16226 and it has refined this feature in the new Build 16237. According to Microsoft the UI layout has been improved and more details are provided within the tab content. What you see above is a work-in-progress, further improvements are promised to the GPU monitor in future builds. Head on over to the official Microsoft blog for further info on the features and bug fixes in this build. Finally..! though there have been 3rd party tools to resolve the scaling issue since day 1, I don't really need an MS fix now. I'd think for such an annoying “bug”, most people with High DPI screens would have sought out a fix as a matter of priority when upgrading to W10 - strange to think anyone with an investment in pricey screens would just put up with blurry text/UI. And just to be clear, it is good that MS have resolved it, good for new users, good for people upgrading their screens. Just for me personally I can't even remember the name of the utility that's fixing it for me, it just runs and works, so I don't need the MS fix but I'm glad it has been sorted. Is this the same DPI scaling problems people were complaining about when Windows 10 was first release? Because if so waiting 2 years for it to be fixed seems like an awful long wait.